Jean Ignace Isidore Gérard (13 September 1803, Nancy, Meurthe-et-Moselle – 17 March 1847, Vanves), generally known by the pseudonym of J. J. Grandville, was a French caricaturist. He was born at Nancy, in northeastern France, to an artistic and theatrical family. The name "Grandville" was his grandparents' professional stage name. Grandville received his first instruction in drawing from his father, a painter of miniatures. At the age of twenty-one he moved to Paris, and soon afterwards published a collection of lithographs entitled Les Tribulations de la petite proprieté. He followed this with Les Plaisirs de tout âge and La Sibylle des salons (1827); but the work which first established his fame was Les Métamorphoses du jour (1828–29), a series of seventy scenes in which individuals with the bodies of men and faces of animals are made to play a human comedy. These drawings are remarkable for the extraordinary skill with which human characteristics are represented in animal facial features. The success of this work led to his being engaged as artistic contributor to various periodicals, such as La Silhouette, L'Artiste, La Caricature, Le Charivari; and his political caricatures which were characterized by marvelous fertility of satirical humour, soon came to enjoy a general popularity. 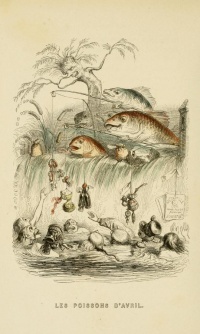 After the reinstitution of prior censorship of caricature in 1835, Grandville turned almost exclusively to book illustration, supplying illustrations for various standard works, such as the songs of Béranger, the fables of La Fontaine, Don Quixote, Gulliver's Travels, Robinson Crusoe. He also continued to issue various lithographic collections, among which may be mentioned La Vie privée et publique des animaux, Les Cent Proverbes, L'Autre Monde and Les Fleurs animées. Though the designs of Grandville are occasionally unnatural and absurd, they usually display keen analysis of character and marvellous inventive ingenuity, and his humour is always tempered and refined by delicacy of sentiment and a vein of sober thoughtfulness. He died on 17 March 1847 and is buried in the Cimetière Nord of Saint-Mandé just outside Paris. A short notice of Grandville appears in Théophile Gautier's Portraits contemporains. See also Charles Blanc, Grandville (Paris, 1855). 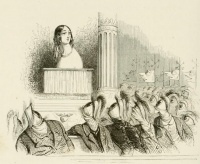 Grandville's ability for political provocation made his work much in demand. He worked in a wide variety of formats, from his first job illustrating the parlor game Old Maid, to illustrated newspaper strips of which he was a master. His illustrations for Le Diable à Paris ("The Devil In Paris"; 1844–46) were used by Walter Benjamin for his study of that city as an urban organism. One of Grandville's supreme achievements, at a time when French printing technology was ascendant, was Les Fleurs Animées, a series of images that are both poetic and satirical. 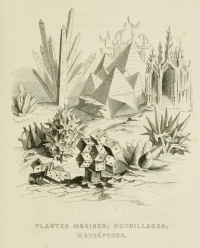 But perhaps his most original contribution to the illustrated book form was L'Autre Monde, which approaches the status of pure surrealism, despite being conceived in a pre-Freudian age. Leading members of the Surrealist movement such as André Breton and Georges Bataille recognised in Grandville a significant precursor and inspiration for the movement. The rock band Queen used part of his artwork for the cover and backcover of their 1991 album Innuendo, and Alice in Chains used part of his artwork for their album Alice in Chains. The graphic novel Grandville by Bryan Talbot was greatly inspired by Grandville's illustrations. Peines de cœur d'une chatte anglaise et autres scènes de la vie privée et publique des animaux d’Honoré de Balzac Paris, Hetzel et Paulin, 1842. Petites misères de la vie humaine, Paris, Fournier, 1843. Ouvrage plein d’humour et de jovialité, avec un grain de prétention, œuvre d’un malin esprit auquel le crayon de Grandville a donné une originalité toute parisienne. Cent proverbes, Paris, H. Fournier, 1845. Jérôme Paturot à la recherche d’une position sociale de Louis Reybaud, Édition illustrée par J.-J. Grandville. Paris, Dubochet, 1846. Cette édition contient des illustrations de J.-J. Grandville et l’humour noir exploité par ce dernier ajoute énormément au texte de Reybaud. L’influence de l’écrivain et de l’artiste est toujours évidente dans les ouvrages satiriques consacrés à la politique de nos jours. Les Étoiles. Dernière féerie par J.-J. Grandville, Texte par Méry. Astronomie des dames par le Comte Foelix. Paris, G. de Gonet, 1849. Catalogue Illustre de la Collection Dessins et Croquis Originaux, Paris, Plon Frères, 1853. Aventures de Robinson Crusoé, Traduction nouvelle. Édition illustrée par J.-J. Grandville. Paris, Garnier frères, 1870. Les Fleurs animées, illustrées par Grandville, Texte par Alphonse Karr, Taxile Delord et le Comte Fœlix. Nouvelle édition avec planches très soigneusement retouchées pour la gravure et le coloris par M.Louis Joseph Edouard Maubert, peintre d’histoire naturelle attaché au Jardin des Plantes. Paris, Garnier Frères, 1867. Petites Misères de la vie humaine, Paris, H. Fournier, 1843. Unless indicated otherwise, the text in this article is either based on Wikipedia article "Jean Ignace Isidore Gérard Grandville" or another language Wikipedia page thereof used under the terms of the GNU Free Documentation License; or on original research by Jahsonic and friends. See Art and Popular Culture's copyright notice. This page was last modified 23:01, 15 February 2015.